Due to an exhausting first week and a bout of tummy troubles, I'm two days behind on TeachThought's blogging challenge. Time for some Sunday Ketchup (what we call "Catch-Up" in my classroom!). Day 5's challenge was: Post a picture of your classroom, and describe what you see - and what you don't see that you'd like to. There's this thing called "House Blindness" that I totally have. Living in a place day after day, I stop noticing the details, everything becomes "wallpaper", where the individual elements no longer stick out. At home, this goes doubly for the little piles of paper and school supplies I leave all over the place that drive Captain Handsome crazy. I've also developed "Classroom Blindness". When I'm told my room is "too cluttered" by Health and Safety, I honestly can't figure out the problem is. Similarly, I took some photos before the first day and, looking at them, I thought my room looked dull and boring. Taking some time to reflect with this prompt, I'm trying to look at my room with fresh eyes and reflect on its purposeful set up. EDIT (Sept 7th, 2014 at 1:30 p.m.): The design for the classroom was made by my students from last year. They reflected on what worked for them last year and what they thought would make a great learning space for my future students. This week, my current students will be planning the "Dream Classroom" set up and we may make some changes. The week before school, I was lucky to have the help of two of my brothers and my teaching partner to move furniture, boxes and piles of books around. Last year, my grade 5/6s rearranged furniture at the end of the year, thinking about (what I then thought would be) the incoming 4/5s (as you know, I'm now teaching 3/4s!). They created this amazing reading nook, complete with the ever popular Bungee Chairs, foldable tables and lamps. I tried to empty out the coat-room as much as possible in preparation for students. I selected coat hooks for them, which were labelled on Day 1. The 2 bulletin boards straight ahead were rarely used last year. I need to make better use of that space this year. The standing shelf beneath the bulletin boards is awaiting our Chromebooks! I love starting the year off with tablecloths on the tables. These are cheapo thin plastic ones from Target. They don't last long, and I'm completely fine with that. This year, they lasted all the way until Friday and our first painting project. You'll also notice my amazing bay window and stage area in this shot. It's always a popular place for students to read and work. Under the blackboard (yes, I still have two huge blackboards in my room! ), you'll notice cardboard bins - those are students Book/ECLIPSE boxes to be filled with their ongoing reading. Under those are their "Work Apartments", which hold notebooks, duotangs and other in-class work. I can't stand desks, so these solve the personal storage issue when a classroom is desk-less. 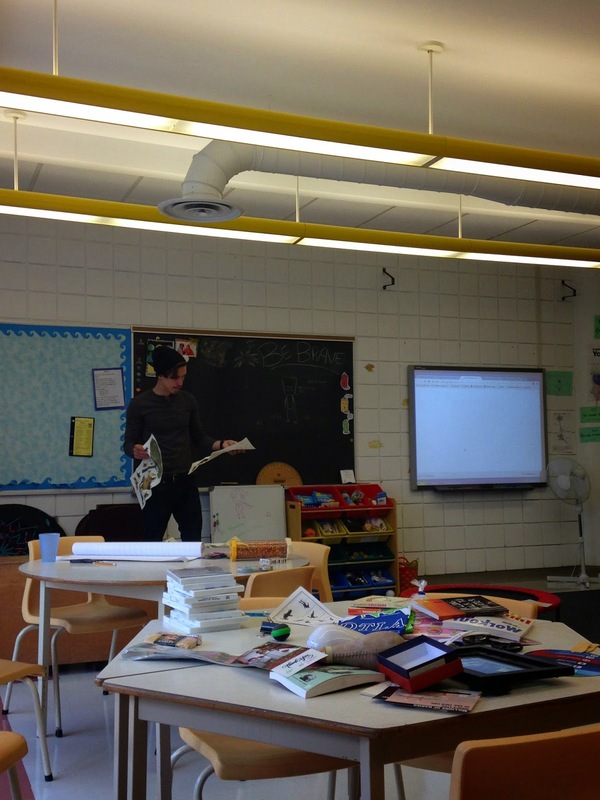 I always set up my classroom with tables (the larger the better!) to make collaborative work part of our classroom culture. I really wanted to get rid of my teacher desk this year, but couldn't find a way to do it. I spend a lot of time outside class hours working there, and have a special chair because of my terrible back. Students' French time happens each morning so that I can have Prep, and the students stay in the room at this time. My desk space is a working space for me with my teaching resources easily accessible behind me. You can also see my projector (hung from the ceiling), which is an essential, daily resource. Right now my computer is working terribly (I am awaiting a replacement) so I'm not able to rely on my projector. More than ever, I'm actually using my blackboard! You'll notice a former occupant of my room taped a Word Wall onto the huge blackboard. I don't love it. Maybe with 3/4s, it will be more useful, though. A use my enormous carpet many times a day. Students and I gather there for instruction, discussion and large and small group work. This year, I have primary and junior sized chairs because I have primary and junior sized people! Our class supplies are all shared and are located in several places around the room. The daily supplies like pencils, rulers and scissors are sorted into sections and back onto my desk. The huge wooden structure behind the blue table is the cage for our awesome class pets, Speedy and Caine (they're degus). I adore having live animals in the classroom and so have my students! Our world map has pins in it indicating the global connections the students and I have made since I moved into this room. We hand make a calendar each month and refer to it regularly. Tiiu made me "Kid President" posters for each month of the year. On the top right of this photo, you'll notice my two precious "Muppet Workshop" Muppets. I made these guys in NYC at FAO Schwarz. Norman is green. He doesn't know any math. We help him a lot. Hedwig is purple, she isn't that confident at reading. Students like to help her out too. Between the Muppets and the globes is my ever-expanding octopus collection. I collect globes. This collection has been much larger in the past, but several were destroyed last year. You'll notice a strip of patterned duct tape on the left hand side of this image. I measure my students three times during the year - the first day, the last day before winter holidays and during the last week. It's fun to see how much they grow during a year! On the counter, you'll see a blue and white bin. Those are Hand-In and Hand-Back boxes. Completed forms and work go in the blue Hand-In bin. Putting them on my desk results in the Desk Monster consuming them mysteriously. Putting them in my hand is never relaible. The Hand-In Box makes sure I can get the work students complete! I empty this at least once a day. The Hand-Back Box gets filled with things that need to be returned to students after I've given some feedback. Soon, a student will have the job of being "Hand-Out Clerk" and hand these back to students. Also on the counter are boxes of books organized by month. I got this idea from a colleague. I hope this will keep my read-alouds organized this year and remind me to get through certain books each month! In the shelves below are reference materials (dictionaries, thesauruses, rhyming dictionaries, atlases) and non-fiction books. There is an overflow of some picture books here as well. On Friday, the day I was *supposed* to be writing this post, one of my new students was a "Pickle" (he'd finished his "Mustard": Must-do and "Ketchup": Catch-up) work. He picked to work in his Imagineering Book. 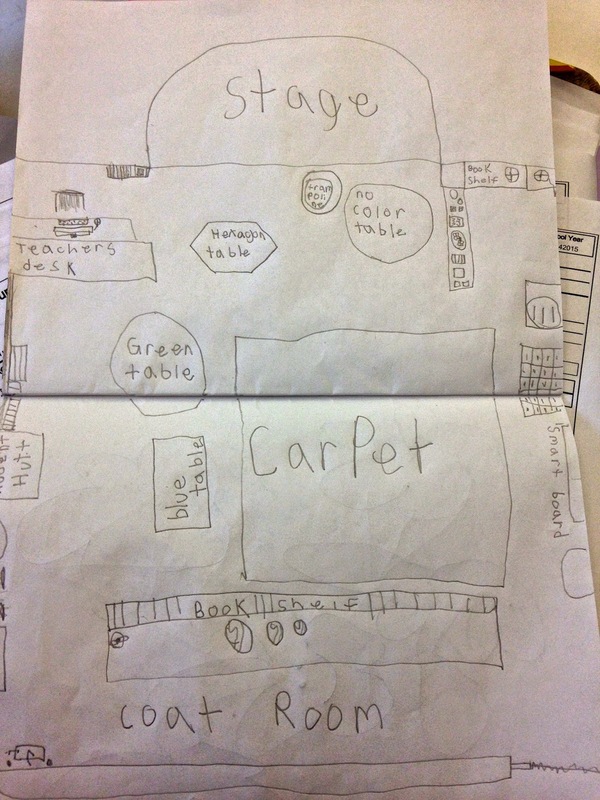 He surprised me by coming to me with this awesome diagram of our classroom! I told him the serendipity of his drawing choice and asked if I could post it. He agreed! Above is what I see when I look at my room. 1. Students! My room is so much more interesting when filled with the little people who spend hours each day working and creating in there. I'm still waiting for all my media permission forms to come in and then I can share what it looks like full of my team. 2. Student work: On all the bulletin boards, there is space for student work. I look forward to those filling up and changing over the course of the year. 3. A standing work space: I like to offer students a variety of places and ways to work. Some work sitting, some lying down, some in Bungee Chairs. I'd like to raise one of my tables this year. I've noticed that some of my students enjoy standing up to work anyway and know that it will be better for those who hunch over tables to have a table at standing height instead. 5. 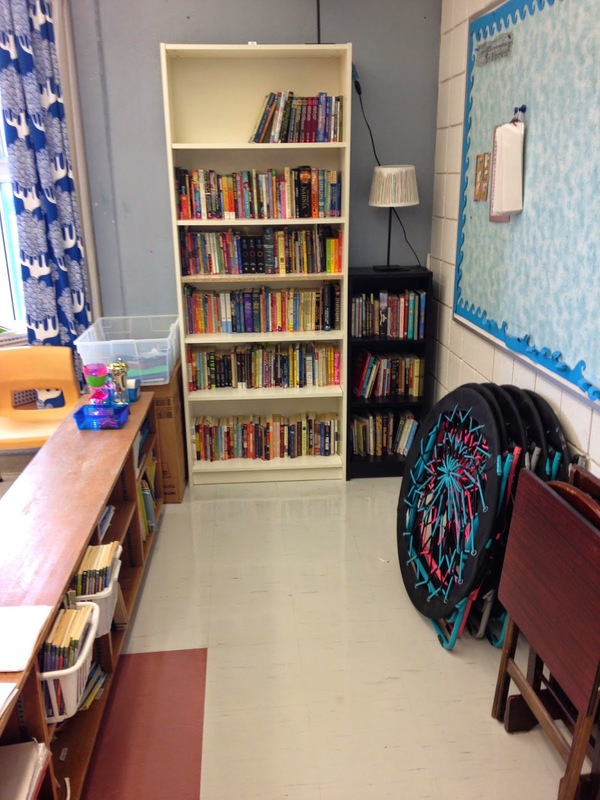 A better organized class library: I'll enlist the students to help me with this. I'm not sure if we are going to sort books into bins or standing up. I like having them standing up only because they take less space that way. I'd like the students to have the largest voice in this, though, as they're the ones who will be using the class library all year. Right now, novels are on the tall bookcase (which was a gift from last year's class!) and the horizontal one is filled with picture books. I look forward to seeing how my team wants to organize our library. (I do, admittedly, have a desire to organize them all in rainbow-order, but don't know how practical or helpful that would be to my readers!). When you look at my room, what do you see and wonder about? 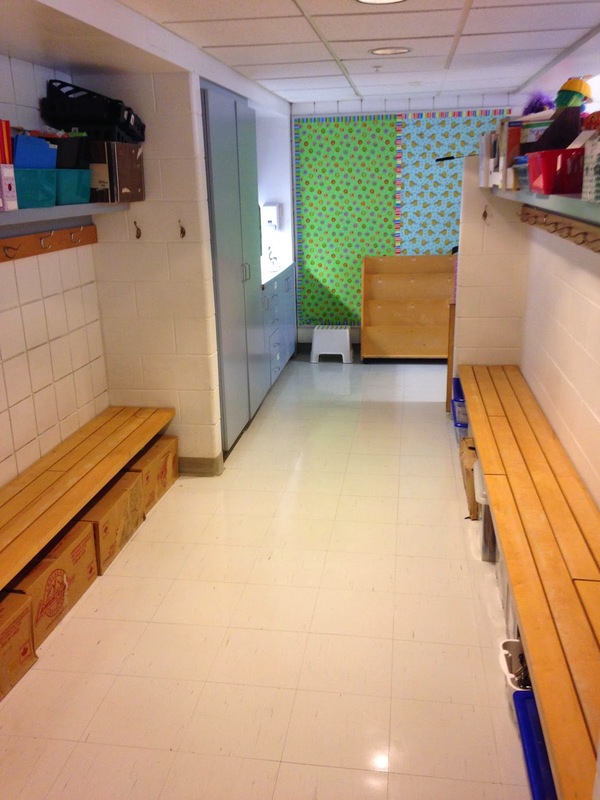 What are some things that make your room a great learning space? What do you think I should add, change or think about? What are you still thinking about in your classroom? Classroom space sure impacts the learning environment and having room for students to choose how and where to work. I never had a teacher desk as I thought it took too much space, in your case it seems like you do need space to work during French. I like the gathering space in the middle and it opens up the area. I am still wondering like you by having a stand up table or bar stand for working standing up. I like the variation of homey furniture too. The stage contribution from your students is a fantastic idea,. Offering a variety of places is always is a great idea. The tablecloths add color to the room.Did they stay on while students were working? Looking forward to seeing how the furniture will change in the next few weeks. Thanks for the comments. The table cloths did stay on for work and eating times. I have a set of Hallowe'en table cloths that are a little sturdier that will go on in October. The kids always love them. So great to have teachers like you who make their students design and enjoy their learning environment I just wish I worked at the same school with you. We share lots of the same thinking and learning. Looking forward to your next posts. Thanks so much! Someday I hope we can work together. The different boards and languages might make that tricky, but I'm sure we can creatively figure out a way someday! Start our own school perhaps? Shauna, I would echo Rola's thoughts. I'd be most curious to hear what the students say. Have you asked them some similar questions? What do they think of the set-up and why? If it works for all of you, then I think that's what's most important. The plan for the classroom this year was made by my students from last year. They drew the map and plan to leave with the custodians over the summer. This week, my class will be adding to their "Dream Class" work by drawing "Dream Classrooms" and seeing what we can do to make those dreams come true. Thanks for clarifying, Shauna! This is a very interesting idea. I like how this year's class will be making their "dream classroom," so that the plans can change based on their interests/needs. I'm curious to hear and see how this classroom does change. Oh!!! You have so many wonderful ideas! I love the idea of teaching the puppets both reading and math. Such a simple strategy that will help with their own metacognition. Also measuring the students height three times a year! I am definitely kidnapping that idea. What a way to make the students feel at home. Like a mama putting the heights on the door frame. This is so sweet.